The Patrick Evans Foundation has supported prostate cancer research at The Institute of Cancer Research (ICR) by awarding the funds to purchase a -80 degree freezer - a vital piece of laboratory equipment. The ICR is one of the world’s most influential cancer research institutes. Their mission is to make the discoveries that defeat cancer. The ICR is a world leader at understanding the genetics changes that make an individual more likely to develop certain cancers - this information can be used to guide clinical choices and develop new treatments. In September 2015 Catherine and Alun Evans visited the ICR’s Sutton laboratories to meet Professor Ros Eeles, Team Leader in Oncogenetics, and her team. The scientists discussed the numerous national and international genetic studies they undertake, including the UK Genetic Prostate Cancer Study (UKGPCS). Led by Professor Eeles, the UKGPCS is the largest prostate cancer study of its kind in the UK and isfocused on patients who develop the disease at age 60 or younger, as well as those who have multiple cases diagnosed within their family throughout the UK.There is also a large collection of samples from men treated at The Royal Marsden, diagnosed at any age. The researchers aim to find specific associated genetic alterations, enabling family members to be screened to see if they are also at a higher risk of developing prostate cancer. With this level of insight, researchers can go on to develop new prostate cancer treatments and prevention strategies for the future. 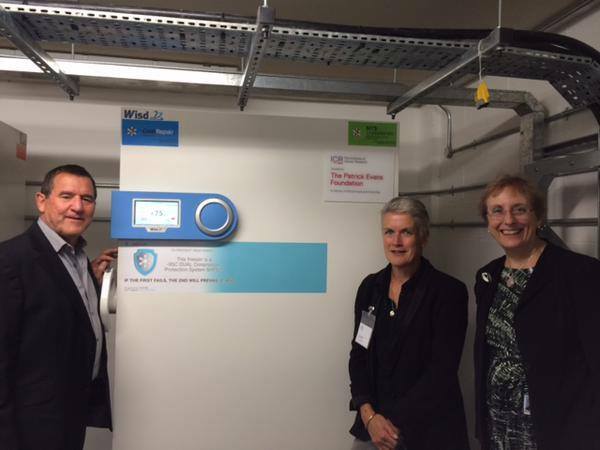 The new state of the art -80 degree freezer funded by the Foundation is a crucial piece of laboratory equipment. Used on a daily basis, it safely stores blood and tumour samples from a large number of patients taking part in various genetic studies. For more information about Professor Eeles and her research please visit the ICR website.